Every 2 weeks I have to change the 2 off line 3µ filter elements because of filter blockage. We analysed the oil and the results are good. No severe contamination. The oil temperature before the filter is 35°C and the tankvolume is less than 1000l when the machine is in full operation. Is it possible that the VI improvers or antifoam additives block the filter element? I am not agree to say it may come antifoam. or any other additive. for what purpose the hydrauli is? Did you find the time to check the results from the ananlysis? They are posted in the other topic under oil analysis. It is a hydraulic machine with 15 cilinders. They are used to handle an installation where they pour over hot melted aluminium (that is in a large basket) into an other reservoir. Today I was informed from the oil supplier that there were no antifoam additives added to the oil! So there must be a silicone contaminant source. In the attachement the picture of the gelatinous substance on the filter element. Another area to check would be the formulation in use in the product, "Silica" is an alloying element for Aluminium, may be product contamination? ?The image appears to be cleaner than expected, there does not appear to be any discoloured lubricant deposited?? 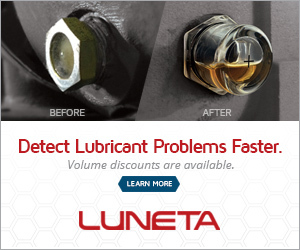 Have you changed the oil (brand, type or viscosity) recently? Sometimes, when you change the brand of the oil, different package of aditives are used, and maybe the Si could remain in the system. If you haven't change the oil recently, I think that you should look for an external contamination. We changed the oil four months ago, for the reason that with the previous oil we had the same problem with the filter blockage. There is a tranparant high molecular deposite all over the filter element and that is the reason why we have to change the filter every 1 or 2 weeks. As we found high levels of silicon with the filteranlysis we pressume that that is the composition of the deposite. Run MPC to determine if there is the potential for varnish in the oil.Degradation mechanisms as you describr are caused by; oxidation,thermal degradation, contaminants and others. I would get a SEM (Scanning electronic microscope) examination done on the gelatinous material - check if it is armorphous - generally related to additive material. 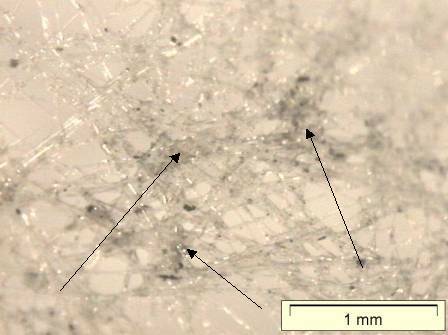 The photo you posted shows what appears to a crystalline structure. I am not familiar with the hydraulic oil you are using Petronas Sunvis. Check with the oil supplier to see if they have changed the formulation. Check if the product contains any zinc antiwear chemistry and a Viscosity Index modifier (polymer material designed to increase the viscosity index). Ask your oil supplier if they have conducted any filterability test on the hydraulic oil - ask for 3 micron and 100mL of oil to be filtered at various temp - 0C, 25C, and say 40C. You will need to know what portion was filtered and what portion left over - i.e. at what point did the filters block. To solve your delima with regards to filtration - increase the filter to 5 micron peferably with a beta ratio of 200. Ensure the oil is warm when passing through the filters. The other alternative is to speak to your oil supplier and use a hydraulic oil that is zinc free and contains no Viscosity Index modifier - see if you get the same effect with the filters. I looked your product up on-line an the data sheet implies this i a group I product with a ZDDP additive package. I would suggest asking the supplier if this product has been changed to a Group II Base oil. If this is the case there may be an explanation. My experience with a customer using AW Hydraulic Oils, in India, was similar white deposits. An investigation revealed that this was due to ZDDP breaking down in the presence of water/moisture, when under high or continuous load conditions i.e. with increasing temperature and pressure. White deposits choked/blocked the filters with white deposits of Zinc Oxide. In your posts you mentioned of white deposits constituent to be Si and Ba. This is a bit odd!! If the plant is located in a sandy/desert area it is understandable. But Ba? ?